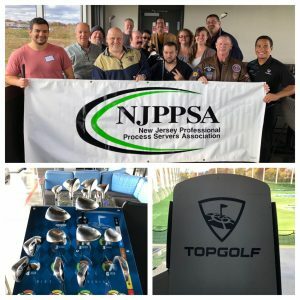 NJPPSA held a networking event at Top Golf in Edison on Saturday, November 3rd, 2018. The primary goal of the event was to network with fellow process servers to build a network of trusted professionals and grow referral sources. Another goal of the event was to have a good time! The overall verdict of the event? Mission accomplished. We had a blast! Despite a windy and cloudy start, the skies quickly turned blue and attendees took advantage of Top Golf’s unique technology to compete on the driving range. Top Golf mixes the ability to track your golf ball and score points with the atmosphere of a lounge and restaurant, which meant guests had plenty of opportunity to eat, drink and relax between rounds. The event was a great success and is planned to be repeated in the spring. We hope you will join us! With guests coming from New York and Pennsylvania to join in the networking activities, the plan is to spread the reach for the next event to provide even more opportunity to expand your network. NJPPSA believes in the power of having other trusted process servers you can turn to, whether to handle a rush service or answer a service question. In this industry the ebb and flow of work changes constantly and it’s always good to have knowledgable resources to turn to should the need arise. Rather than being considered competition, think of other process servers as a support network for your growing business.